Paris’ storied history of Christianity extends from the fall of the Roman Empire through the French Revolution of the late 18th century. Today, the region is home to more than 100 notable churches and basilicas that are recognized as prime architectural achievements of the Gothic school of architecture, including the city’s only true cathedral, the world-renowned Notre-Dame de Paris, immortalized in the 1831 novel The Hunchback of Notre-Dame. Many of these magnificent structures house seminal Catholic reliquaries, elaborate royal tombs, and ornate pipe organs and are open to the public for self-guided tours, weekly mass services, and public classical concerts. Eglise du Dome, or the Dome Church, is the official church of Hôtel des Invalides, which was constructed as a home for injured soldiers during the reign of France’s King Louis XIV and is now home to several prominent museums, including the Musée de l'Armée, France’s national military museum. The church’s construction was commissioned in 1676 and it was designed by architect Jules Hardouin-Mansart, who envisioned the facility as a dual royal and veterans’ chapel. Its glittering golden dome, modeled after Rome’s St. Peter’s Basilica, is considered today to be one of the greatest achievements of French baroque architecture and served as the inspiration for the design of the United States Capitol Building in Washington, D.C. Today, the church is best known as the final resting site of Emperor Napoleon I, whose remains are housed within the elaborate Tombeau de Napoléon Ier mausoleum. La Madeleine is a Roman Catholic church that is centrally located within Paris’ 8th arrondissement, adjacent to the Palais Garnier opera house, the Place Vendôme, and the Place de la Concorde. 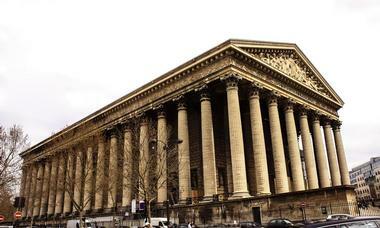 Designed by architect Pierre-Alexandre Vignon, the 1828 church is modeled after the temples of ancient Greece and was originally intended to serve as a pantheon to the armies of Napoleon I. It is adorned with internationally renowned features such as Charles-Joseph Lameire’s neo-Byzantine mosaic and Jules-Claude Ziegler’s History of Christianity half-dome fresco. Daytime and evening classical concerts are held periodically throughout the year, highlighting the church’s 56-tone grand pipe organ constructed by Aristide Cavaillé-Coll. 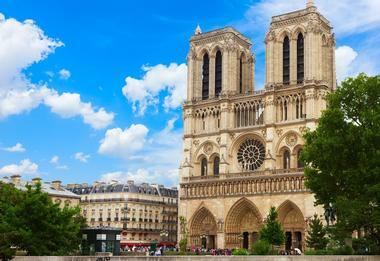 Notre-Dame de Paris Cathedral is one of the grandest and best-known Catholic churches in the world. Its enduring legacy in popular culture stems from its immortalization in Victor Hugo’s 1831 novel The Hunchback of Notre-Dame, which was adapted into a Disney animated film in 1996. The church is considered to be one of the greatest examples of French Gothic architecture and was one of the first structures in the world to incorporate flying buttresses into its design at its completion in 1345. 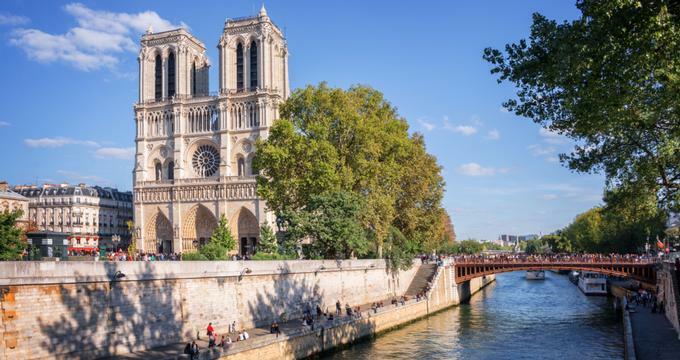 Today, the church is considered one of Paris’ most significant buildings and is one of the city’s top tourist attractions, drawing more than 13 million annual visitors. 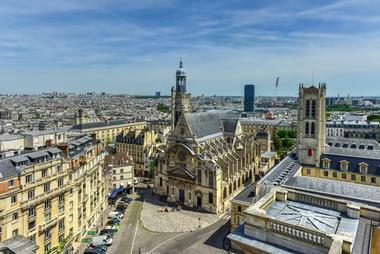 It serves as the seat of the Archdiocese of Paris and contains a reliquary housing several major Christian artifacts related to the crucifixion of Jesus. 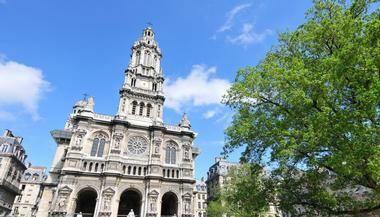 The Paroisse de la Sainte-Trinité was constructed in 1867 and designed by Parisian architect Théodore Ballu, who is best known for his reconstruction of Paris’ Hôtel de Ville city hall building. The church earned its international reputation thanks to its connection to renowned composer Olivier Messiaen, who served as its organist throughout much of the 20th century. Its Renaissance-style facade has inspired numerous churches around the world, including Quebec City’s Saint-Jean-Baptiste Church and Sacramento’s Cathedral of the Blessed Sacrament. Works by notable French artists are highlighted throughout the church’s design, including Eugène-Louis Lequesne’s exterior sculptures representing charity, faith, and hope. The Church of Saint-Séverin is one of the Left Bank’s oldest remaining churches, with origins dating back to the 11th century. The church was originally constructed over the tomb of noted hermit Séverin of Paris and was expanded into a large Gothique Flamboyant-style church in the 13th century. 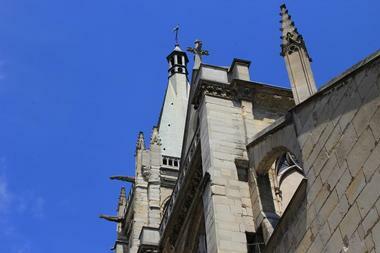 It is best known as the site of the first recorded gallstone surgery, performed by physician Germanus Collot in 1451. The church’s interior design features classic and contemporary elements, including the oldest remaining historical bell in Paris, dating back to 1412, and a set of modern stained-glass windows designed by Jean René Bazaine in the 1970s. Weekly church services are held, along with periodic public organ concerts showcasing famous national and international instrumentalists. 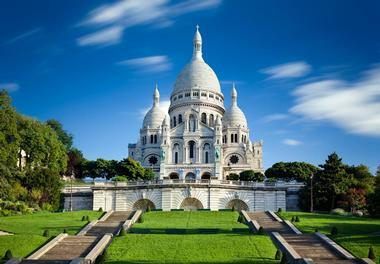 The Sacré-Coeur Basilica’s name translates as the Basilica of the Sacred Heart, a reference to its dedication to the Sacred Heart of Jesus, which represents cultural images of a sympathetic and loving Christ figure. 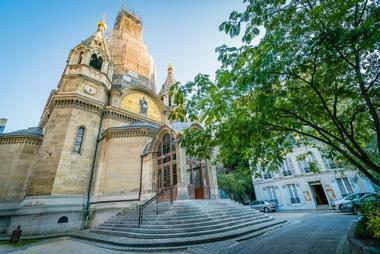 The church is located at Paris’ highest elevation at the summit of Montmartre and features distinct Romano-Byzantine architectural elements, noted at the time of their construction for their contrast to the popular neo-baroque style. Nationalist themes are emphasized in the church’s interior elements, in accordance with the church’s design as a monument to the victims of the Franco-Prussian War and the unification of Catholic and secular institutions within the city under the governance of the Third Republic. A miniature version of the church, known as the Sacré-Coeur de la Balata, is located in Fort-de-France, Martinique and was constructed to house refugees from the 1902 Mount Pelée eruption. Saint-Alexandre-Nevsky Cathedral was the first Russian Orthodox Church in Paris at its consecration in 1861. Today, it serves as the seat for the Patriarchal Exarchate for Orthodox Parishes of the Russian Tradition throughout Western Europe, though it has not been associated with the Patriarch of Moscow since the Russian Revolution in the early 20th century. The neo-Byzantine style church is dedicated to the 13th century Grand Prince of Russia and is best known as the site of the 1918 wedding of legendary Cubist artist Pablo Picasso and his wife Olga Khokhlova. Other high-profile ceremonies held at the church include the wedding of world chess champion Vladimir Kramnik and the funerals of artist Wassily Kandinsky and opera singer Fyodor Chaliapin. 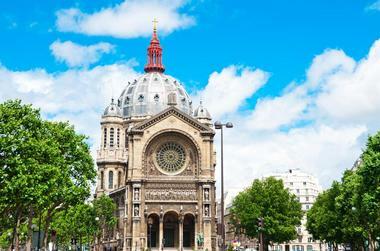 Saint-Augustin Church is one of the crowning jewels of the 19th century renovation of Paris by the Second French Empire, planned under the supervision of architect Georges-Eugène Haussmann. The church’s location and design were intended to act a counterpoint to the famous La Madeleine church and serve as an intersectional vista at the end of the boulevard Malesherbes, located within the city’s 8th arrondissement. 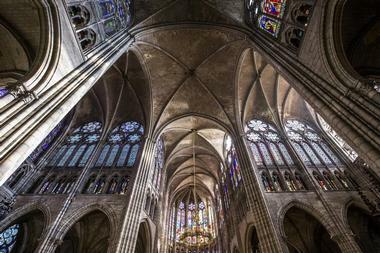 Architect Victor Baltard’s blend of Romanesque and Tuscan Gothic elements gives the church a unique eclectic style, which highlights its François Jouffroy-designed frieze depicting Jesus and his apostles. Interior elements highlight a statue of Joan of Arc sculpted by artist Paul Dubois and notable paintings by artists such as William-Adolphe Bouguereau, Émile Signol, and Jean-Hippolyte Flandrin. 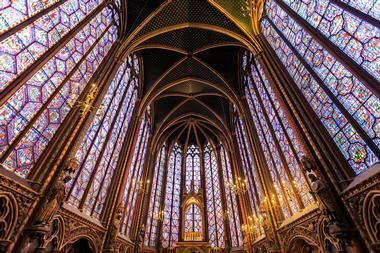 Sainte-Chapelle is the royal chapel of the Palais de la Cité, which served as the royal residence for France’s kings through the 14th century. The Gothic-style chapel was commissioned by King Louis IX as a reliquary for several notable artifacts related to the Passion of Christ, including the fabled Crown of Thorns. Though the original church structure was extensively damaged during the French Revolution, the church has been restored to its original condition as the result of major renovations in the 19th and 21st centuries. Today, the church is considered a prime example of Rayonnant-period Gothic architecture, which is noted for its emphasis on vertical structural elements and the sense of weightlessness its design conveys. It houses one of the largest known collections of 13thcentury stained glass in the world, highlighting more than 1,100 Gothic-style windows. Saint-Etienne-du-Mont is located within Paris’ Latin Quarter adjacent to the Panthéon and preserves the shrine of the city’s patron saint, Sainte Geneviève. The church’s origins can be traced back to the 6th century abbey of Sainte-Genevieve, which was expanded several times throughout the 13th and 14th centuries before a complete reconstruction and relocation in the 15th century. The church briefly served as the Temple of Filial Piety during the French Revolution, but was renovated and restored as a Catholic institution by architect Victor Baltard under the auspices of the Second Empire. Today, the church is considered one of the most beautiful religious institutions in the city, showcasing the only remaining rood screen in the region, constructed in 1545. It has been featured in a number of popular culture novels and films, including Ernest Hemingway’s A Moveable Feast and Woody Allen’s Midnight in Paris. 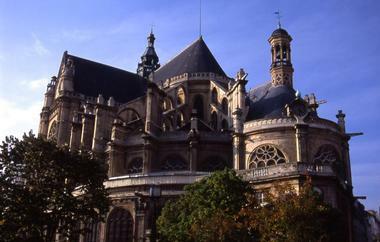 Saint-Eustache Parish is one of Paris’ most-visited churches, noted for its cathedral-scale dimensions and masterful late Gothic architecture. The church served as the site of King Louis XIV’s first communion and the baptismal sites for French luminaries such as Molière, Richelieu, and Jeanne-Antoinette Poisson, who would become the Madame de Pompadour. Its architecture combines elements of Renaissance and Gothic design with the incorporation of a number of classical details and bears similarities to Pontoise’s Saint-Maclou church. It houses the country’s largest pipe organ, which showcases 8,000 pipes, and hosts classical symphony and choral performances throughout the year by national organizations such as the Orchestre National de France and the Chœurs de Radio France. 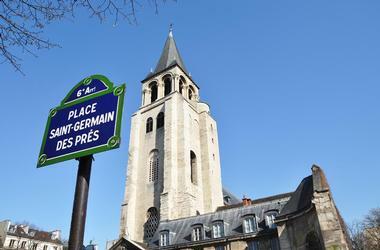 The Benedictine Abbey of Saint-Germain-des-Prés is the eponymous center of the 6th arrondissement’s famed cultural district, which served as a hub for the existentialist movement of the 20th century. The church was originally constructed in the 6th century, making it one of the city’s oldest remaining churches today, and became as a major cultural and intellectual center after the founding of its scriptorium in the 11th century. Today, the church’s surrounding district is home to cultural attractions such as the École des Beaux-Arts school of fine arts, the Musée national Eugène Delacroix, and a number of the city’s most famous cafes, including Café de Flore, le Procope, and Les Deux Magots. Saint-Denis Basilica and Royal Necropolis is located in the northern Parisian suburb of Saint-Denis and dates back to the region’s era of Roman occupation, when it was used as a Gallo-Roman cemetery. The current basilica is an extension of the Saint-Denys de la Chapelle, constructed around 475, which became the center of a larger monastic complex by the Middle Ages. Its 12th century renovations and additions, designed by the Abbot Surger, are considered to be the first known Gothic-style structure, while its 13th century nave is noted as an early predecessor for the Rayonnant style of Gothic design. 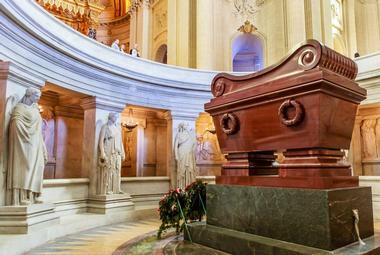 The church’s royal necropolis serves as the burial site for several of France’s kings, including the archaeological crypt of its eponymous saint. Saint-Paul-Saint-Louis Church honors two influential figures in French history: The country’s King Louis IX, who was granted sainthood by the Catholic and Anglican Churches, and Saint Paul, the First Hermit. The church was constructed between 1627 and 1641 and designed by noted Jesuit architects François Derand and Étienne Martellange to replace the former 7th century Chapelle Saint-Paul-des-Champs. Its design, which was modeled after Rome’s Church of the Gesù, blends elements of Italian and French baroque architecture and features a Dutch-inspired facade. Today, the church serves as the namesake for the Place Saint-Paul and houses a large collection of religious works of art created after the French Revolution, including Delacroix’s Garden of Olives and de Letin’s The Death of St. Louis. 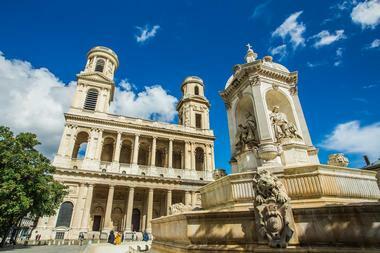 Saint-Sulpice Church is the second-largest religious establishment in Paris after the famed Notre-Dame de Paris Cathedral, measuring 113 meters long by 58 meters wide (370 by 190 feet) and stretching to a height of 34 meters (111 feet). 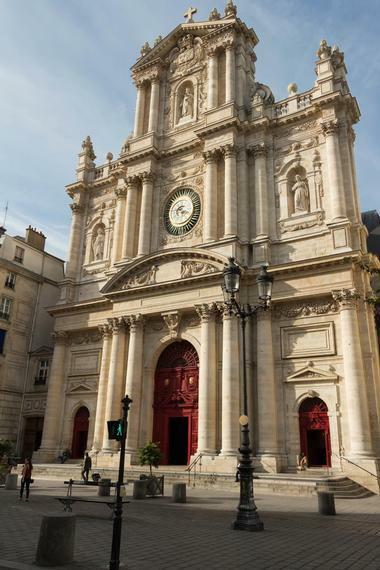 Though it has been a major Paris landmark since 1646, Saint-Sulpice Church is best known today for its pivotal role in Dan Brown’s 2003 mystery-thriller novel The Da Vinci Code. While the hollow space under the church’s floor depicted in the novel is fictional, its famous floor line is visible to visitors, marking the fixed date of Easter. Other major features include an 18th century gnomon and one of the finest pipe organs in the world, showcasing 6,500 pipes and five-layered keyboards.